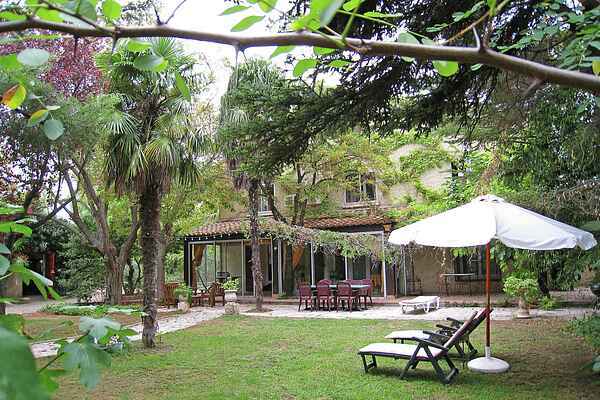 A large character house boasting a private swimming pool, nestling in a pleasantly wooded garden on the outskirts of Narbonne. Walking and mountain bike enthusiasts will be spoilt for choice as they choose between the shady banks of the Robine Canal, the steep paths on the La Clape massif and Bages lakes, which are of particular interest to bird watchers. Visitors who absolutely must laze about on the beach can devote themselves to their favourite recreation at one of the three resorts offering huge expanses of white sand: Gruissan the liveliest, Narbonne Plage a little quieter and more family oriented and Leucate, more picturesque and sporty. All three are within a radius of less than 30 km. As for cultural discovery, this is an area where history has left its mark and it is easy to travel between the Roman town of Narbonne, the Medieval town of Carcassonne, Fontfroide romanesque abbey and the surrounding Cathar castles.